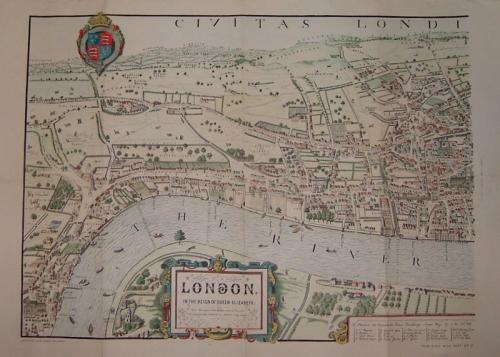 Title: ' Civitatas Londinum...London in the reign of Queen Elizabeth'. An interesting set of two maps that were produced in the nineteenth century in 'Cassells Old and New London' based on the 1560 Ralph Aggas map of London. There is much fascinating detail of Elizabethan London including a moated Tower of London, old London Bridge and an intact London Wall. Most of the present urban environment is fields. The condition is good with only a few small (1 - 2 cm) repairs to the folds. The map could be joined to make one panorama.